I hate to admit it, but I'm not a huge sweet potato fan. I'm much more into savory foods so I've been trying to come up with ways to cook sweet potatoes that will make me LOVE them! 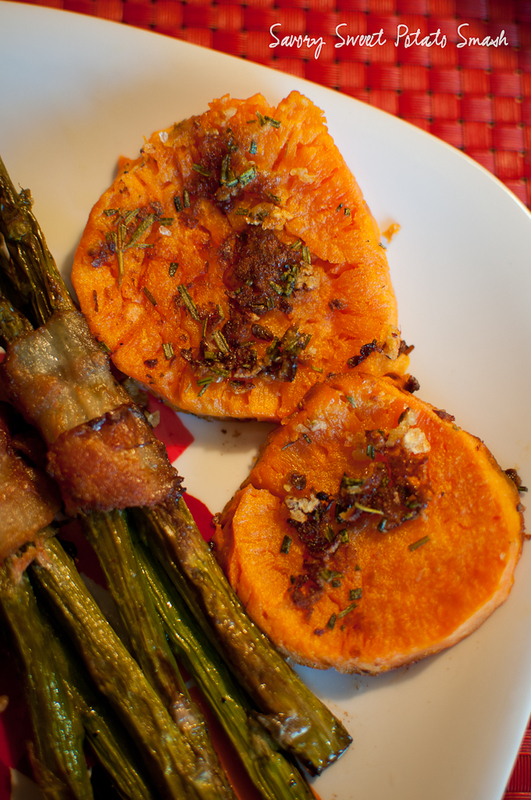 This little Easter side dish was pretty dang good! 1. Peel your sweet potato and slice it into 1/2 inch rounds. 2. In a saucepan and over medium-high heat cook your water and sweet potato rounds. 3. Once your water boils, remove the sweet potato rounds from the water and set them aside so they cool a bit. 4. While your rounds are cooling, heat the bacon grease in a large skillet over low to medium heat and add in the minced garlic and chopped rosemary. You want to make sure they really infuse and don't burn so don't wait until your grease/oil is too hot. 5. While things are infusing use a glass cup to gently smash the sweet potato rounds. You don't want to smash them too hard, just enough to break apart the edges a bit. 6. Add them to your skillet, season with salt and pepper and let them cook up really good. I let them go for about 15-20 minutes on each side so they got a nice and crispy outside layer. The crunchy bits of rosemary and garlic made these so so good! !